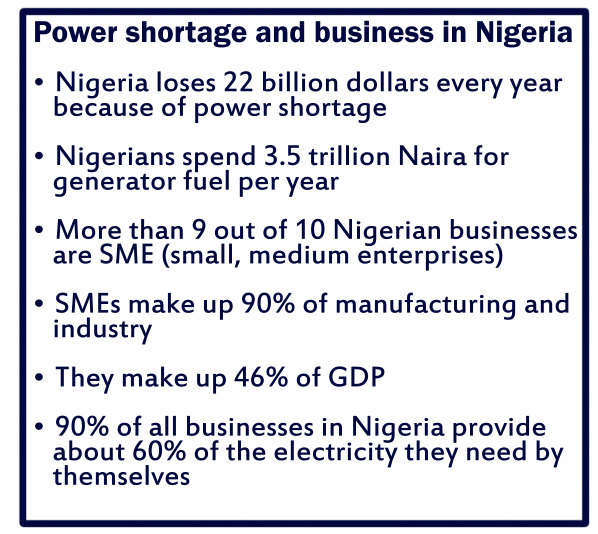 Small businesses are most affected by Nigeria’s constant power cuts. Whether they are barber shops, cyber cafes, hair dressing saloons or tailor workshops, their owners cannot predict the amount of power they will get on any given day, and often have to turn away customers. Whereby in East Africa, renewable energy has carved out a market for itself, it is still rare to see solar, wind or biomass systems installed in Nigeria. Because of the unregulated importation of sub-standard solar products into Nigeria, solar has gotten a bad name here and small businesses are reluctant to invest their hard earned monies. But industry experts like Segun Adaju of Blue Ocean, a renewable energy firm, are convinced that the tide is turning. “With the Pay As You Go Solar business model, we can move the investment risk from the customer to the solar company, which will be obliged to provide high quality products and services”. Adaju has piloted the scheme with a Lagos barber. “In the beginning, the barber was hesitant when we sat down to crunch the figures. But he soon realised the business opportunity because he did not have to buy the solar panels upfront, but is allowed to pay for them over a period of two years. After this period, the panels belong to him and his electricity is free”. The barber and the expert are ahead of the game in Nigeria, where policy makers usually concentrate on big fixes to the national grid, which have been promised for the past twenty years or more, under different names such as ‘Gas Revolution’ and ‘Power Sector Reform’. Yet in reality and despite the massive allocation of funds to the power sector, Nigeria today has just enough power to provide every citizen with three light bulbs. The lack of success in expanding the national grid has not distracted politicians to believe in the grid, thus ignoring the potentials of off-grid solutions. Despite the ubiquitous belief in the grid and the Gas Revolution, until now no government has offered a funding concept for establishing a grid of gas pipelines, which would transport Nigeria’s gas wealth from the Niger Delta and the South East to every nook and cranny of the country. The cost seems mind boggling, as the single kilometre of gas pipeline costs about 1 million US dollars, and Nigeria would need a minimum of 10,000km. To this, one would have to add the cost of feeder and power stations. Besides the oil and the gas, Nigeria is also rich in high quality coal, so it is not surprising that politicians are proposing coal fired electricity generation as an affordable solution to the energy crisis. However, the hidden cost of coal – the health cost, environmental destruction and social problems associated with large scale coal mining and power generation – are not calculated or even mentioned in Nigeria. In fact, there is hardly any factual debate in public about the different options for generating the 200,000 Megawatt that Nigeria will need in the next fifteen years. Already, some insiders in the energy industry are talking about importing second-hand coal power plants. Whether based on gas or coal, the revamping of the national grid is going to take years. But small business does not have the luxury of time to wait for the big fix. The amount of electricity many SMEs need is small enough to be provided from a solar panel on their roof. Just like in Tanzania and other neighbouring countries in East Africa, where Pay As You Go Solar companies are installing up to 1,000 such systems per month, amounting to more than 1 Megawatt in total for the whole country, the Nigerian private sector could ‘go it alone’. Where the solar company offers high quality products, warranties and services, the customers can rely on regular electricity supplies, which gives them a chance to increase their business activities and plan ahead. Where customers do not pay their bills, the companies can cut their services by remotely disconnecting the panels. The impact of these ‘islands of power’ on agriculture would be felt immediately. Cassava is one such example: farmed mostly by women in the southern part of Nigeria, 40 per cent of fresh cassava goes to waste because it needs to be processed or sold within 48 hours after harvesting. With transport and processing facilities lacking in many places, fresh cassava goes to market for a paltry N 10,000 per tonne on average. However, a tonne of dried cassava yields 8 times as much. How would women farmers not embrace the opportunity of having an on-site facility to dry their cassava? Off-grid solutions can power these value chains anywhere in Nigeria, whether it’s based on solar or biomass (cassava peel is an excellent raw material for power generation, as it is not consumed by animals and is regarded as waste). PAYG Solar is an imminent possibility to provide limited amounts of electricity to millions of Nigerian businesses and households. In the end, this model cannot replace the grid, which is much needed for industrial development. But off-grid solutions provide an important contribution to Nigeria’s development, not only because they are faster to install and more likely to create employment, but also because they are accessible to women entrepreneurs. 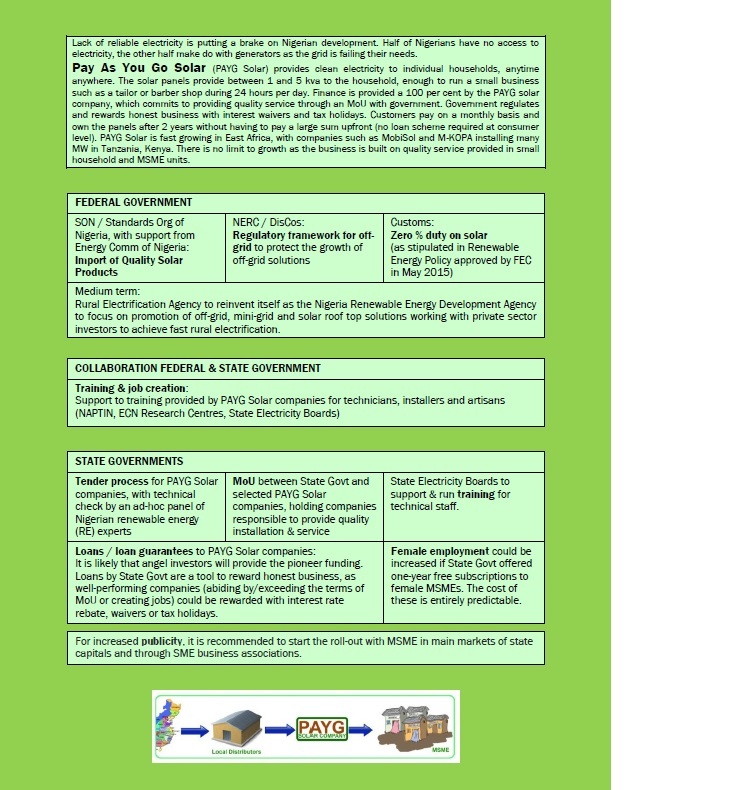 PAY AS YOU GO SOLAR (PAYG SOLAR) Executive Summary. We are glad to writing to you about our interest in the PAYG Solar.The information provided about the shortage of energy,the effects , the PAYG solar initiative and the benefit in the short term and long term is appreciated by our organization which is keen to partner with you to provide PAYG solar services in our locality :the Niger Delta Area. Our organization 'Initiatative for Development Education and Learning' provides information ,support and services that help people live better lives . 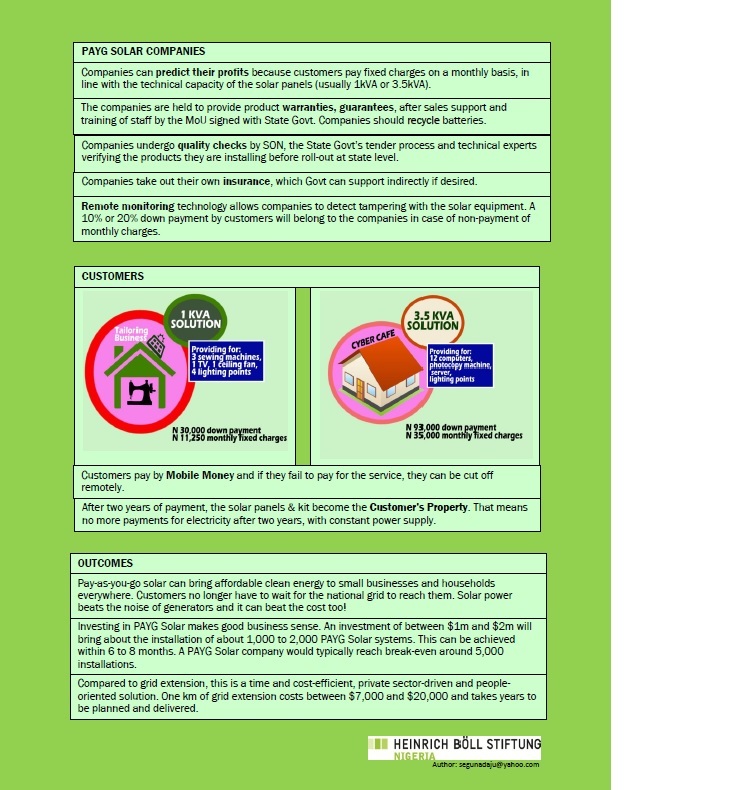 our existing project testify to to impact we are making in our locality. Our IDEal IT center project presently providing training services to people in Asaba and environs of Delta State which can be prototyped or replicated in smaller versions as projects in rural communities while our organization provide all the support services for the Centers. We therefore want a situation we can gain from your expertise ,partner with you in delivering PAYG Solar and in collaboration with you want to see how we can solve the particular energy needs in communities. You are assure of our highest Esteem. we look forward to partnership ,becoming a partner with your organization , exploring areas of mutual interest and we can do together and we can be a part of this laudable programme. we can work together in the future. Hello, I am interested in your solar business. How do I be part of it.